Active Region 11967 consisted of a major sunspot that released numerous solar flares in early 2014. Above is an image taken by the Solar Optical Telescope (SOT) aboard Hinode in the Calcium II H line on Feb. 7, 2014 at 16:09 UT. 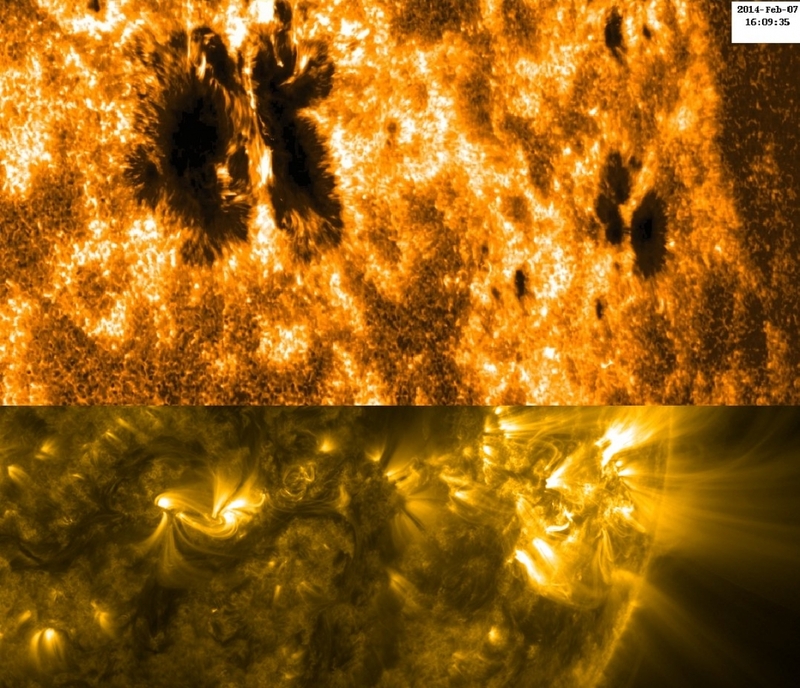 Below is a wider view of Active Region 11967 as seen by SDO on Feb.12, 2014, at 01:35 UT. By studying the sun’s magnetic field, scientists hope to shed new light on explosive solar activity that can interfere with satellite communications and electric power transmission grids on Earth and threaten astronauts on the way to or working on the surface of the moon. In particular they want to learn if they can identify the magnetic field configurations that lead to these explosive energy releases and use this information to predict when these events may occur. Led by the Japan Aerospace Exploration Agency (JAXA), the Hinode mission is a collaboration between the space agencies of Japan, the United States, the United Kingdom and Europe. NASA helped in the development, funding and assembly of the spacecraft’s three science instruments. Hinode is part of the Solar Terrestrial Probes (STP) Program within the Heliophysics Division of NASA’s Science Mission Directorate in Washington. The Solar Terrestrial Probes Program is managed at NASA’s Goddard Space Flight Center in Greenbelt, Md. NASA’s Marshall Space Flight Center in Huntsville, Ala., managed the development of instrument components provided by NASA, with additional support by academia and industry. The Lockheed Martin Corp. in Palo Alto, Calif., is the lead U.S. investigator for the Solar Optical Telescope.